of, or in excess of 72 mph / 118km/hr (32 m/sec). Objective: To understand the formation of Atlantic Hurricanes and what causes the intensity to change as it travels over its course. Starter: How are hurricanes born? Watch the video from the BBC Weather Centre to the right. i. What are the key ingredients for tropical storm formation? ​ii. Why is warm sea water (over 27°C) vital to tropical storm growth and expansion? iii. Why is the 'Eye Wall' so dangerous? iv. 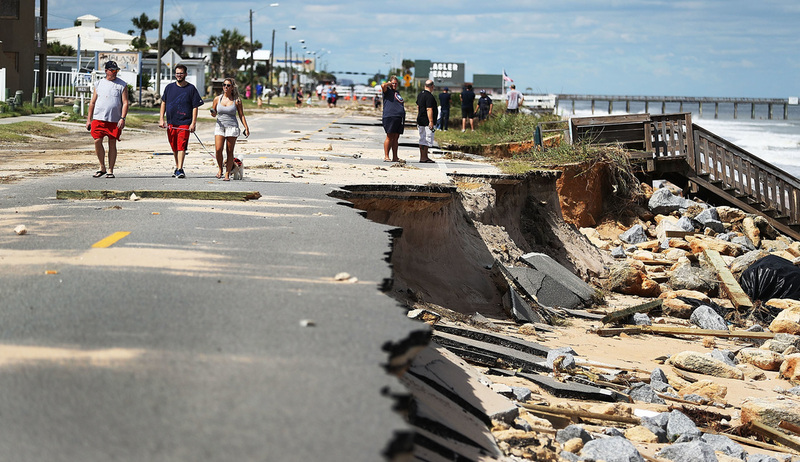 Outline the different ways that life and property can be under threat during a tropical storm. 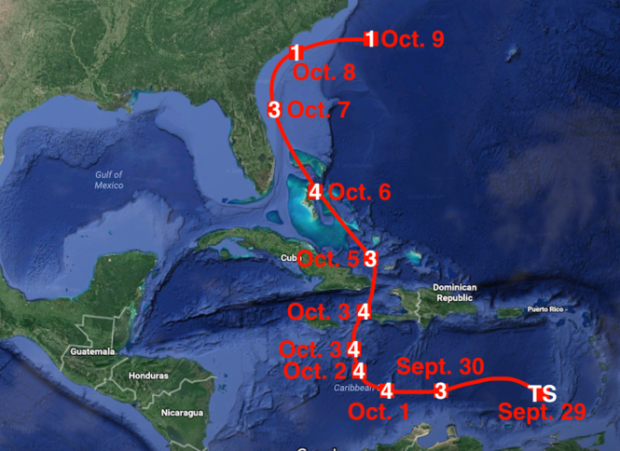 v. What kills off a tropical storm and why? Task 1 - The first image to the right shows historical tropical storm activity plotted onto a Pacific centred map. i. Comment on the spatial distribution of tropical storms globally. Ensure you use the following terms to improve your response. Task 2 - Wind intensity is during a tropical storm is measured on the Saffir-Simpson Scale. The yellow (4) & red (5) tracks on your map indicate the most powerful storms. i. Outline the areas of the world most prone to severe tropical storms? ii. Is there any historic evidence of hurricane activity here in Europe? Check out this news from October 2018. Task 3 - Using the YouTube 'Why Hurricane Categories Make a Difference' & 'Hurricane Storm Surge' videos to the right, complete the worksheet on the tab below. ​This site might also be of use. Task 4 - Using the diagram below, describe the track of the storm and the strength as it passes both Haiti and the coast of Florida. Task 5 - Using the same diagram, give the dates when Hurricane Matthew was at its strongest. Task 6 - Explain using your knowledge from earlier in the lesson why the strength of the storm reduces rapidly as it moves northwards and towards the east coast of the USA. Objective: To use data to compare the socio economic impacts of Hurricane Matthew on Haiti and the USA. Does level of economic development affect the ability to prepare and react to the event? 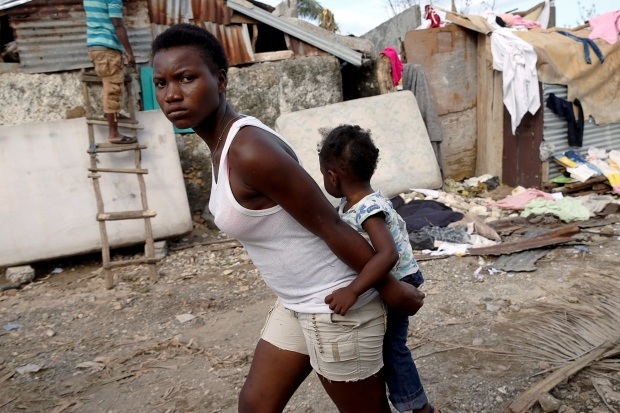 Haiti as suffered from a series of natural disasters over the past 20 years. Most recently, the country was decimated by a huge earthquake in 2010 (covered here in tectonics unit). Recovery work was still under way and many thousands of people were still living in temporary accommodation as towns and communities were being rebuilt. In 2005, the USA suffered from the worst Hurricane on record, Katrina which killed over 1000 people in the area surrounding New Orleans (covered here). Both countries have had recent natural disasters, but how did the same storm impact both nations? Task 7 - Click here to access the GapMinder site. This chart shows you each of the countries that were impacted by Hurricane Matthew in October 2016.
i. Hover over each of the countries to see the GDP per capita $ and life expectancy. Record the values on the worksheet (above) for Haiti and the USA. Task 8 - Read this excellent comparative news report from the BBC which highlights the impact of Matthew on both Haiti and the USA. i. Fill in as much of your comparative sheet as possible using the information within the article as guidance. You should the resources below to supplement your range of information. For most up to date information, please check out this specialist page set up by The Guardian. This page from the New York Times has some useful maps and amazing photos and traces the impact of the Hurricane on Haiti. Task 9 - Watch both videos from PBS NewsHour beneath from both affected areas. Add any additional information regarding the responses from rescuers and aid agencies. Additional reading ..... The ROLE OF CLIMATE CHANGE .